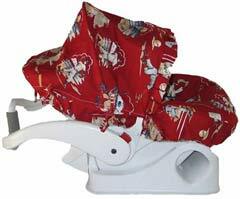 Has your baby spit up one too many times on the infant car seat carrier cover? Or… are you preparing your current seat for your second child? If you’ve washed the original cover just too many times, the good news is that you can get replacement covers for your baby car seat. My first child was a boy and my second, a girl, so I know all about changing things over from boy blue to pretty pink. When you have a car seat that is relatively new and still in great shape, it makes good sense to save money by simply replacing the cover. Especially when you know that they grow out of the infant car seat so quickly. 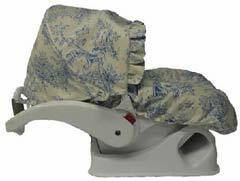 Sometimes, too, babies can make such a mess over and again that replacing the car seat carrier cover is preferable to using a stained and faded cover. While the appearance of the cover won’t hurt your baby, moms always want the best for our little ones. There are all levels of car seat covers available from the affordable basics to luxury posh covers. Some of the simpler covers are the replacement covers available from the manufacturer or waterproof models such as those by Messeez. Other brands will pimp out your kids ride in high fashion. For hot styles, check out Hot Toddies, Baby Bella Maya or Itzy Ritzy, among others. These companies not only sport couture for the baby set, they also test for safety. You can find a replacement for your infant car seat carrier cover, convertible car seat, front-facing car seat or booster seat. There is a great selection available fitting almost any theme. I’ve seen everything from favorite sports teams to construction; princess to garden. It is useful to consider, however, if you can find a great sale on an infant car seat carrier, it can be more economical to replace the car seat all together. The choices abound.